Carol has a background in development work e.g. voluntary work in the Women’s movement in the 70s and 80s. Then she did self-help work. She started the Self-Help Project from scratch in Derby at the CVS 1987-1992 and loved it. Carol set up 140 groups in four years. She worked on all sorts of stuff and issues and worked with community workers and people in community. Carol loved the work but had a difficult boss who bullied her; her parents were getting older; so, she looked to come back to Hull. She applied for a City Council Community Officer job, but she wasn’t able to go to the interview as something cropped up. A few weeks later, Carol was in Hull for a job interview. She phoned the Community Centres Manager (Hull City Council- Leisure Services). Another Community Officer job had come up. Carol applied and had an interview for this job and got it. (1992). The Community Officer post wasn’t pure community work as it was supporting community centres, the cleaning staff, ensuring health and safety checks etc. There were difficult relationships with some of the Centres. Apart from Carol, the Community Officer team were all male. Carol left this job to join DOC in 1996 to do community development. Ros (Abbott) had the difficult patches! Carol was happy to have Orchard Park and North Hull. This was a mature community with many years of community – led organisations. There were good people and structures. She got a lot out of that. Carol talked about one of the situations on the North Hull/Orchard Park patch. The Schultz Centre, when the diggers moved in to demolish it. She parked her car in front of the entrance to stop any more happening as a community group wanted the building. Carol moved on after two years 1998. Moved to NHS as a Community Health Development Worker because she was very interested in health issues. Carol’s previous work in self-help influenced her interest in this job/work. 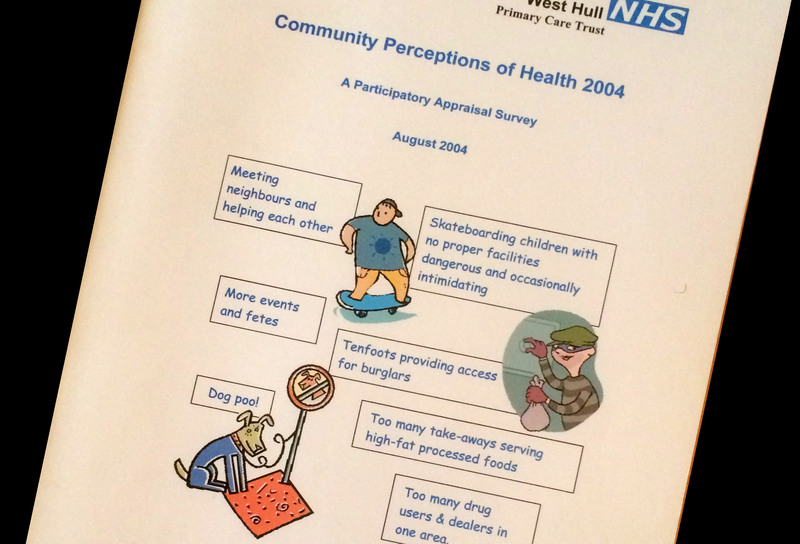 Carol and her friend in Health Promotion had already worked together in North Hull. “ I feel she never ‘got’ Community Development – She had difficulty setting boundaries between professional working and friendship with people”. This friend later became Carol’s boss. Funding for Healthy Living Centres became available, and the local NHS encouraged the development of bids. Carol hit the ground running and because she knew the people/area in North Hull could soon bring people together. There were 10 projects included in the successful HU6 Healthy Living Centre bid, including Age Concern, a health information project, food projects, youth projects etc. It mixed ages and issues, covered a range of health issues, and included a Community Health Development post. Carol co-ordinated the Healthy Living Centre (HLC) bid and worked with volunteers and paid staff. She was also running the information project and had a committee going before the Healthy Living Centres grant was finalised. At the time Carol had her normal CD work, supporting people dealing with issues such as parenting, healthy eating, drugs etc. She was effectively taking on 3 separate roles. Very stressful. The Primary Care Trust (NHS) was the HLC lead organisation and handled the finances. Carol had gone to the finance guy in the NHS, but the work was constantly delayed. She was told not to bother him because he had cancer. She later discovered he hadn’t got cancer; he had been charged with fraud against his employer. Things got more complicated. After three and a half years the Healthy Living Centre got Lottery funding. The Community Health Development Worker (CHDW) post was needed to hold it together – Carol’s existing post. However, the appointed HLC Co-ordinator told Carol that “she wasn’t needed!” Carol never got to the bottom of this. It was a massive blow. There was no longer work for Carol to do in North Hull. So, Carol asked to move to another patch, and joined another worker in the West Hull office. Carol had depression problems at the time and a difficult manager. Marion Horton from the Community Development Foundation (CDF), at one time worked with the CHDWs. She edited a book that they wrote chapters in about Community Development and Health. The first Director of Public Health managed the CHDWs, didn’t appear to know what she was doing with the CHDWs, so was unable to provide good supervision or support. Pressure was gradually put on for CHDWs to do more Health Promotion work e.g. weight management. Carol didn’t like this because the focus wasn’t community development but health education. But Carol set up new health groups e.g. walking groups. Carol set up a proper research project into the health benefits of exercise in community-led groups, with statistical assistance from the NHS epidemiologists. Nationally there was interest in this work, but epidemiology support was not always available, and interim results were inconclusive. There was another change of management (Carol’s 5th manager in this post). Carol then felt she was bullied by her manager. So, Carol spoke to the Union rep and was advised to talk to the manager about the bullying. Half an hour later, Carol was put under disciplinary action. Carol eventually got a ‘slap on the wrist’ and the manager was recommended to retire, which she did. Then, yet another new management structure was put in place. Carol was employed in the same post by four different NHS organisations in 12 years. In the last stages, Carol perceived that the PCT were wanting to do away with the Community Health Development Workers posts for various reasons. Jobs were redrawn to avoid a redundancy situation. When the PCTs (Primary Care Trusts) were going to be disbanded, the Chief Executive Officer (CEO) used this opportunity to make large scale redundancies. Carol took redundancy and retirement at the same time. For the two years leading up to that point, Carol did other work e.g. with GP patient participation groups. There was quite some success with it. In this last period of working, Carol had no pressure to achieve. She took on the task of putting together a Community Health Development interventions online directory e.g. Participatory Appraisal (PA.) Carol put this together and talked to the PCT IT people and a website was developed. When Carol left, this website was not made available to the successor organisation, the CCG (because of course, the PCT, the commissioning organisation, had ceased to exist). The Healthy Living Centres for 3 ½ years. Carol loved the beginning processes. Asking/consulting Orchard Park residents about being healthier and what kind of projects they would like to see. “It was enjoyable for the first year or so”. “It wasn’t CD but working with self-help groups and Asian groups in Derby was memorable. I felt for some of the development workers in minority groups; they were patronised and looked down on when raising issues about health”. Carol went to the funeral of a local volunteer. Rev David Walker at St Michael’s praised Carol’s Local Area Reference Group. Carol also worked with a woman resident from Orchard Park who ”was like my side kick”. "Whatever was on at DOC (Developing Our Communities) in OP, she got involved. She was a person who normally people ignored. But with DOC and getting involved with communities, more possibilities were opened up for her. “She had had a lousy life and felt she was doing something good for the first time in her life. It was a pleasure to be able to work with someone like that”. "Working with someone like LB, from the local residents’ group. I once had a three-hour meeting with him and Z about DOC working in the area and offering support from DOC if they needed it. It was extremely antagonistic”. However, working on health groups, developing the HU6 network, Carol also supported them getting some money to do things. Louis Barron organised a takeover of the committee and took over the running of the organisation. A local vicar said, “All it takes for evil to prevail is for a good person to do nothing”. All the money then went on his personal projects, not available for the whole area. NB—Carol feels that City of Culture need to be made aware of Community Development importance. She feels Hull’s communities may not be fully involved.